I was co-captain of this aircraft, tail number C-FDIL, which was operated by a company called Pacific Airboats and/or Can Air Services. We flew the west coast of British Columbia between Vancouver and the Queen Charlotte Islands. The company only operated for a single season in 1980 and I subsequently ended up driving DC3's in the western Arctic for Terra Mining and Exploration as well as for Buffalo Airways (world's largest fleet of radial-engine aircraft) and Northwest Territorial Airways in Hay River, NWT and Yellowknife, NWT. More on Don McDonald's flying days! "My dad was the pilot of the Flying Fisherman for Can Air when it flew charters on the coast after he retired from the RCMP Air Services. I believe he is the pilot talked about on your notes." "I have been going thru my father's (Lawrence 'Mac' MacKinnon) pilot logbook. My father was a Lancaster bomber pilot with RCAF 405 sqd during WW2. After the war was over my father and John E. Fauquier got together and started a company called Noracon Exploration. I do not know the acquistion date of CF-DIL, however my father first flew CF-DIL with John E. Fauquier in Toronto on 29April1946. Noracon Exploration also acquired Canso CF-DIK, which Fauquier primarily flew, while my father flew DIL. Noracon Exploration flew pax and mining equipment primarily throughout Labrador, northern Quebec and also Kississing Lake MB. Noracon Exploration ceased flying operations (-as per my father's logbook-) on 31Oct1947." Meanwhile the registration has changed on this Canso, by 2004 it had become N314CF and was in restoration with Hawkins & Powers in Greybull,WY. It was been reported to be destined to participate in the search for the crashsite of Amelia Earheart. But that did not materialize, as one can read further below. If I got the histories right (it was unmarked when I ran into it), I think C-FDIL (N314CF) is the same Catalina as the one I saw at Mojave in 1997. 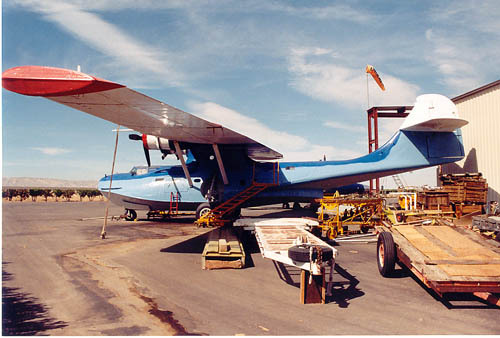 N314CF was reported, during 2001, at Lake Mead, Boulder City and owned by Al Hansen. On 05Dec03 it was registered (still N314CF) for Alegre Air Inc of Santa Fé,NM. It was reregistered as N206M on 24Aug04. Rick Patton sent me pics of N314CF at Greybull,WY in 2000; it had the titles and crewlist of the 'Wings over Alaska Commemorative Flight', by Al Hansen and crew. Aad van de Voet (OldWings.nl) informed me that N314CF became N206M on 24Aug04 for Alegre Air and was subsequently reg'd to Black Cat Aviation LLC in Indianapolis, IN (08Jul08). Present (Nov.2008) location: Bloomington,IN. This photo (no date) was kindly provided by Michael Prophet from his collection. He added the following comments: "N314CF (c/n 427) Canso A (BuNo: 9750). Was active with SAESA (EC-FRG), active as a firebomber at Cuatro Vientos, Madrid (Spain). It flew to the USA in Nov96 and was been painted in blue Navy c/s during Apr97. Owner Albert C. Hansen had it based at Mojave,CA and flew the Catalina up to Anchorage (Aug99) as a guest for A.H.Museum for local display, the aircraft still retains its full fire bombing equipment. It was ferried to Greybull, WY (date?) and stored outdoors, minus its props and outer wings." The Cat ("Tanker 73") is seen here in Spain; photo taken by Ron Mak. Murcia, San Javier Airport, 03Sep94. This Can Air C-FDIL photo was taken by Ron Mak and had ended up in Michael Prophet's extensive collection; he provided me with a scan but found he had no date or location with the slide; this was solved by help from others, read on. I am a Director of the Toronto Aerospace Museum at Downsview. Our plans include repatriating old propliners made by DHC or operated from Toronto .... Have a look: www.torontoaerospacemuseum.com". Thanks Ken ! Confirmation to where the photo was taken was also provided: "it was taken on the East ramp at Victoria Airport (CYYJ). The hangar behind CF-DIL used to be Flying Firemen's, but is now just used to build boats ! " Thanks Brian ! (15Apr04). During Feb.2006 the photographer, Ron Mak, became aware of this discussion and confirmed the photo had been taken at Victoria Airport Vancouver Island, during april 1980. Thanks Ron ! Ron also added the following information on Can Air: "Can Air (not CANAIR), its owner was a Dutch Canadian (Ray Bernard) with 2 aircraft to Can Air's name: C-FSAT en C-FDIL. The former was lost near Hawaii in 1986. Ray had an air service in the Pacific, from Truk Island to surrounding islands." 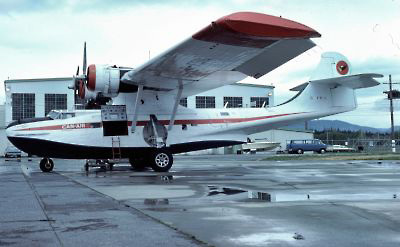 With Canso/Catalina airframes in demand in the post-war surplus market, RCAF 9750 became CF-DIL on the Canadian civil register. Not much information survives on its early civil career but the plane was converted as an airliner and it later operated with Wheeler Airlines, Wheeler Northland Airlines, and Ilford Riverton Airways. One bit of information that does survive is that the aircraft received substantial damage on 17 July 1958 during landing at Ungava, Quebec. However, there were no injuries and the Canso was repaired. 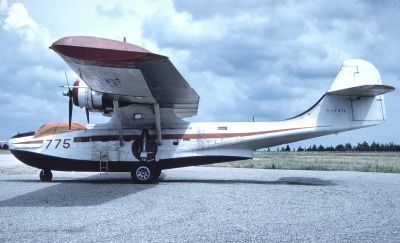 By 1974, the amphibian was being operated by Can-Air in Vancouver who also operated two other Catalinas and used them for hauling fishing parties to remote areas of British Columbia with CF-DIL becoming Fisherman's Special. Strangely, in 1983 the plane was sold to assume a new career - that of a fire bomber. By this time, many Catalinas had been phased out of that mission, but CF-DIL became part of the Flying Fireman of Victoria, B.C.. Suitably modified, the craft became Tanker 5 which was later changed to Tanker 775. In 1988, the company became Awood Air. With the Catalina fleet in Canada growing decidedly long in the tooth, Awood retired Tanker 775 but its career was long from over. The plane made the epic journey east across the Atlantic to Spain where it went on contract with ICONA under the auspices of new owner SAE.SA. In April 1993, the craft assumed the Spanish civil registration EC-FRG after flying in the temporary markings of EC-313. The fire bomber found its main base at Cuatro Vientos and still wore its basic Flying Fireman's red and white color scheme. The aircraft did not see a lot of operation and in October, EC-FRG was sold to Al Hansen of Mojave, California. Carrying the new registration of N314CF, Al and his crew completed the epic ferry flight to Mojave where he painted the amphibian in pre-war US Navy markings. At the time, Al hoped to replace the long-gone fuselage blisters along with other military equipment. The plane still retained its fire-bombing equipment and in 1999 there was some discussion with John Wells about operating the Catalina with his Airborne Fire Attack company but this did not come to fruition. Another interesting idea came up when discussions were held to use N314CF in an epic expedition to find the wreckage of Russian Sigismund Lavanevski's long-range N-209 which disappeared on a flight from Moscow to Fairbanks in August 1937. It is thought that the aircraft went down in the vicinity of Camden Bay which is west of Kaktovik, Alaska. During the original search for the missing Russian, the famous PBY flying boat Guba was utilized in the search. 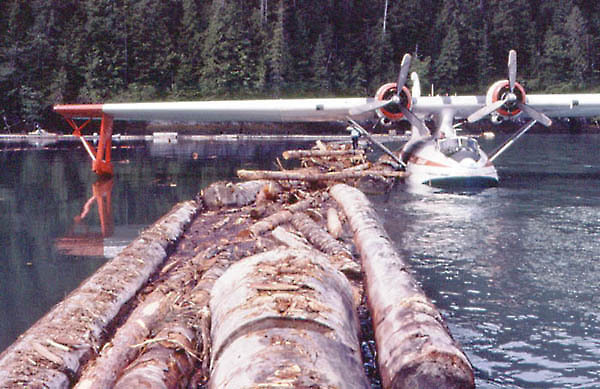 Although the modern search did not come about, Al and his crew did take the Cat north for the Wings Over Alaska Commemorative Flight which celebrated the extensive use of the PBY in that State. Famed oceanographic researcher Robert Ballard (of Titanic fame) had been undertaking extensive exploration regarding the ever-intriguing disappearance of aviators Amelia Earhart, Fred Noonan, and their Lockheed 10 during an around-the-world flight. Ballard and his team had apparently found a very positive reading on what could be the remains of the Lockheed on the ocean floor 'somewhere off Howland Island'. Could one of the last great aviation mysteries be solved? But work at Greybull was never completed on this Consolidated PBY-5A N314CF (owned by one of Ballard's partners) and the search never got underway. A one-time RCAF aircraft, although US-built, was serial 9750. 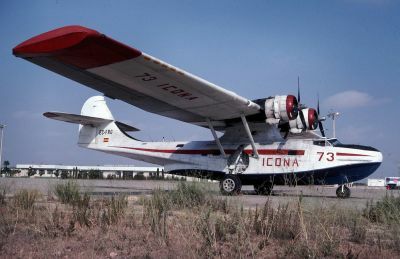 Post-war, it had a long commercial career as a passenger transport then water bomber and has been variously registered CF-DIL, C-FDIL, EC-313, EC-FRG, N314CF and N206M. In recent times, it has been under restoration at Greybull, Wyoming and has had its previously removed bow and blister turrets replaced. Following the death of its owner a while back, it has been for sale and, on 8th July, it was registered to new owners Black Cat Aviation LLC of Indianapolis although it is thought to be still located at Greybull. Another Catalina taking to the air again after a long period on the ground is the San Diego-built, former RCAF Canso A N206M. Resident up in Greybull, Wyoming for some years, it had been intended to use it to search for the missing wreck of Amelia Earhart’s aircraft in the Pacific but this came to naught although ongoing restoration work saw both blisters and an ‘eyeball’ type bow turret installed. Put up for sale when it’s owner died, N206M flew again in the Summer of 2008 and by September was based at Hulman Field, Terre Haute, Indiana for crew training. Apparently, the final preparations for flight were carried out by one Dennis Eiler but the new owner is not seeking publicity for either his identity or future plans at this stage. Great news that it is flying again though. "In 1942 I worked in the Boeing Aircraft plant on Sea Island at Vancouver, B.C., building the Catalinas for the war effort. Worked on the frame construction. After the war, in about 1950, Queen Charlotte Airlines out of Prince Rupert, B.C. used Catalinas for passenger service all over northern B.C. and into the Northwest Territories. When I was in the Reserve Army in Yellowknife, a Queen Charlotte Catalina was hired by the govenment to fly a load of us Reservists from Yellowknife out to Edmonton for training. The plane was really finely done up inside with two stewardesses, plush seats and all ! Also the "bubbles" were still installed for viewing. On flying over thousands of miles of burned and burning bush land, the heat drove that Catalina up and down like an elevator with the wings visibly flexing... Both stewardesses were airsick and lying on the floor with oxygen masks. I never got airsick, from having been in the Navy, I suppose. I also flew on Catalinas which were used out of Yellowknife, when searching for downed planes over miles and miles of barren lands, sitting in the observation bubble. We also used Lancaster bombers for this purpose."